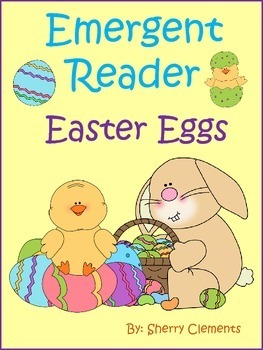 This emergent reader, “Easter Eggs” is connected to several CCGPS listed below. This 13 page book is designed so that you can copy the book, cut it in half, staple, and then it is ready for use. The 13 pages include a title page “Easter Eggs” then each of the remaining 12 pages contains black and white pictures at the top of each page and a sentence under the picture. Grab this CUTE and FUN Emergent Reader HERE! This emergent reader focuses on the following sight words: I, see, number words (one-ten), and color words (yellow, blue, purple, pink, orange, and green). Page 2: I see one yellow egg. Page 3: I see two blue eggs. Page 4: I see three purple eggs. Page 5: I see four pink eggs. Page 6: I see five orange eggs. Page 7: I see six green eggs. Page 8: I see seven colorful eggs. Page 9: I see eight colorful eggs. Page 10: I see nine colorful eggs. Page 11: I see ten colorful eggs. Page 12: I see a basket of eggs. Page 13: The Easter Bunny has the basket!